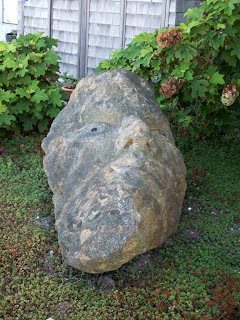 Joe Wheelwright’s stone heads. I met a man who had several of them peering out from around his fireplace; another friend has one in her garden, where he gazes up longingly at her when she comes out on the porch with a glass of wine. Oh, he was my sculpture professor at Wellesley! I love his work! I'm sure he would be thrilled to see his work on your lovely blog!